We decided to learn about changes in the kitchen. Sometimes when you mix materials together they make a new product. If you can get the original materials back it is a reversible change. However, if you can't get your two original materials back, that is an irreversible change. We used vinegar and bicarbonate of soda to create an experiment. When we mixed both materials together we produced a new material. That new material was air bubbles. We chose two materials from the kitchen cupboard and predicted what would happen if we mixed them together. We predicted that it would simply dissolve. 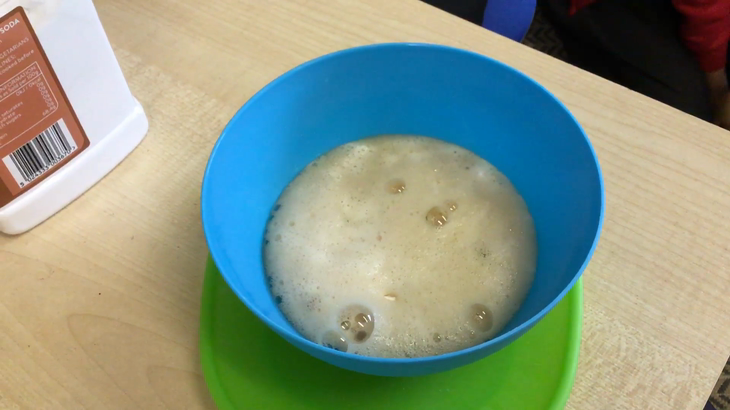 When we tipped the bicarbonate in to the vinegar we were surprised because it all bubbled up and made a froth. When air gets to the apple it goes BROWN!